This soup is the same brilliant shade of green as the smoothies I make most weekend morning. 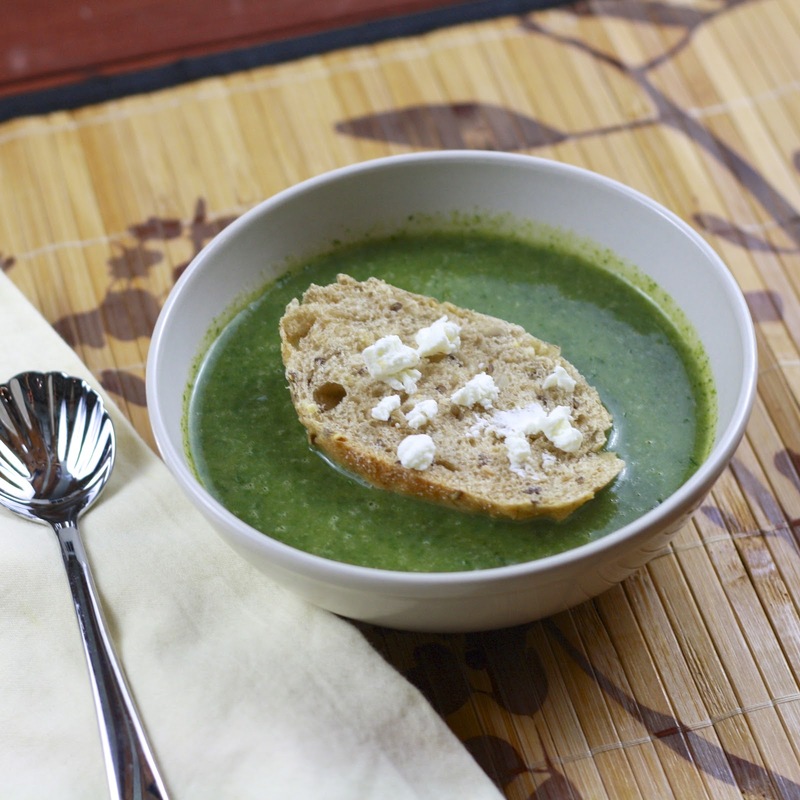 While my green smoothies mask the taste of spinach, the same cannot be said for this soup. Thankfully, I like spinach! I like goat cheese even more, and the addition of it is the perfect tang to counter the earthiness of the spinach. This isn’t a thick, stick to your bones soup, making it a great first course or light accompaniment to sandwiches. Salads are much less appealing as the temperatures drop and we’re all craving warm, hearty meals. This soup ensures you still get your greens! 1. Heat oil in a large skillet over high heat. Add onions and 1/4 tsp salt. Cook, stirring frequently, until onions begin to brown, about 5 minutes. Reduce heat to low, add 2 tablespoons of water with the thyme and cover. 2. Cook, stirring occasionally over low, always keeping the pan covered between stirs, until onions have reduced and are a deep caramel color (30-45 minutes). 3. Meanwhile, combine remaining 2 cups water and 1/4 tsp salt in a large pot. Add potato and bring mixture to a boil. 4. Reduce heat so that mixture is at a simmer, cooking until potato is soft (12-15 minutes). 5. Once onions have caramelized, stir in sherry or Marsala and then add the onions to the other pot with the 4 cups of broth. Return mixture to a simmer. Add spinach, cayenne, and nutmeg. Cover and cook, stirring once, until spinach is tender but still bright green (about 5 minutes). 6. Remove soup from heat and stir in goat cheese, butter, and 1 tbsp lemon juice. Stir until butter and cheese melt. 7. Puree soup with an immersion blender (or in a regular blender in batches) until smooth. Add additional salt / lemon juice if desired.